Looking for a fun family activity? Give your family the gift of dance and make memories that will last forever. 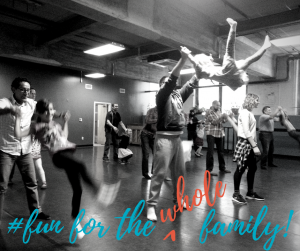 Designed for the whole family, each workshop will focus on a fun, energetic dance form. Workshops will include movement games, introduce basic steps and best of all– you’ll learn a short dance the whole family will love! Workshops are recommended for ages 5+ and all abilities are welcome. No dance experience necessary. An exciting, fun-filled dance class that gives families the priceless opportunity to bond through the art of dance! Up to 3 family members ages 5+ including at least one adult. Please wear comfortable clothing in which you can easily move and bare feet or socks. Questions? Contact Teresa Drews, Youth Programs & Facilities Coordinator, at 414.277.8480 x6006 or via email.